AUBURN, Ala. (AP) — Circumstances have changed significantly since the last time Tennessee’s Jeremy Pruitt matched his defense against Gus Malzahn and Auburn’s offense. 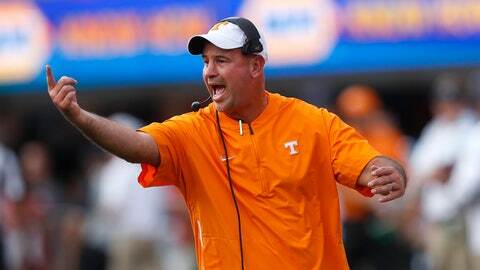 Tennessee (2-3, 0-2 SEC) is seeking a breakthrough league win under Pruitt, who was No. 1 Alabama’s defensive coordinator last season. Auburn (4-2, 1-2) wants to break out of an offensive funk that has turned the defending SEC West champions from league contenders to outliers in the race. The Tigers dropped 13 spots in the rankings after a 23-9 loss to 24th-ranked Mississippi State. Auburn advanced to the SEC championship game, and remained in playoff contention, with a win over Pruitt and Alabama last season. The Crimson Tide still went on to win the national title. Pruitt was also a Florida State assistant in the Seminoles’ national championship game win over Malzahn’s first Auburn team to cap the 2013 season. The stakes are much smaller this time, but the familiarity has only grown. Now, Pruitt faces an offense with quarterback Jarrett Stidham struggling and a running game that lacks the punch it had last season with versatile tailback Kerryon Johnson. Auburn is hoping right tackle Jack Driscoll is able to return after missing the Mississippi State game with a knee injury. Calvin Ashley took his place for an offensive line that has already had troubles. Tennessee is without freshman safety Trevon Flowers , who broke a collarbone during practice. Pruitt said starting safety Micah Abernathy has a “banged-up ankle” but will be ready to play Saturday.